It’s the time of year to start thinking about holiday cards (it’s literally been on my calendar for two weeks… we need to take a picture before my stomach will block the light from the sun) so when HauteLook emailed to say they were offering $50 worth of products from Paper Culture for $20, I took a look. From the few minutes I spent peeking around at the designs I really, really liked what I saw. And when I saw that with the purchase of baby announcements, Paper Culture plants a tree in your baby’s honor, I was sold. In love. As a company, their goal is to plant 1 million new trees (pretty awesome for a company that sells paper products, if you ask me). All of their cards are made with 100% post consumer recycled paper or alternative non-tree fibers. In fact, for every order placed, they plant a tree in a National Forest. How freaking cool is that? 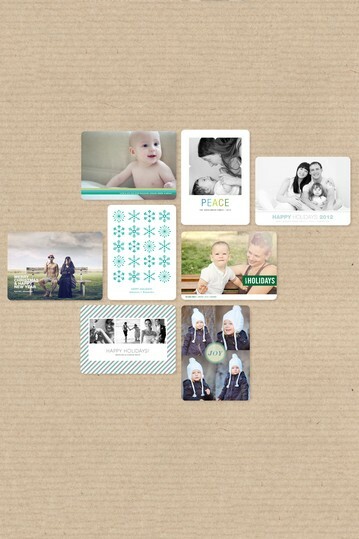 So whether you’re looking for your holiday card, a party invite (which I better get), birth announcements, or even just stationery – I would definitely say check out Paper Culture. But if you want the awesome deal (that’s 60% off people!) you better do it ASAP – because it’s a limited time offer. Ooh, the holidays are in the air and I love it. PS I wasn’t paid or perked by either HauteLook or Paper Culture. Just thought I’d pass along the deal. And just legitimately am impressed with Paper Culture. You guys, I have all but cartwheeled onto the bandwagon and started singing lead vocals when it comes to the animal face on a sweater trend. 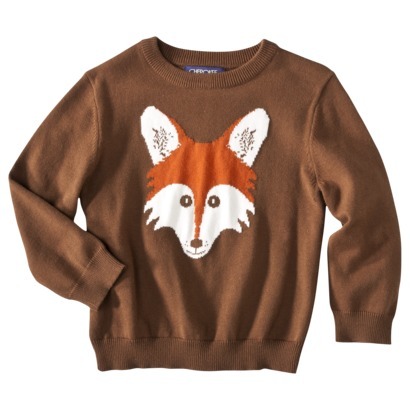 I love it, and I’ve been searching for an affordable fox face sweater for the Babe since I saw this not-so-affordable Christopher Fischer sweater. Well I found it. The sweater above is from Target, is only $12, and will be worn by the Babe next winter… when he can fit into a 12 month size. I hunted around my local Target last night for this sucker and had no luck. So it looks like I’ll be buying a few things from Target.com this morning (I’m trying to get to $50 on all baby stuff we need so I can have free shipping). What trend are you totally digging this season? 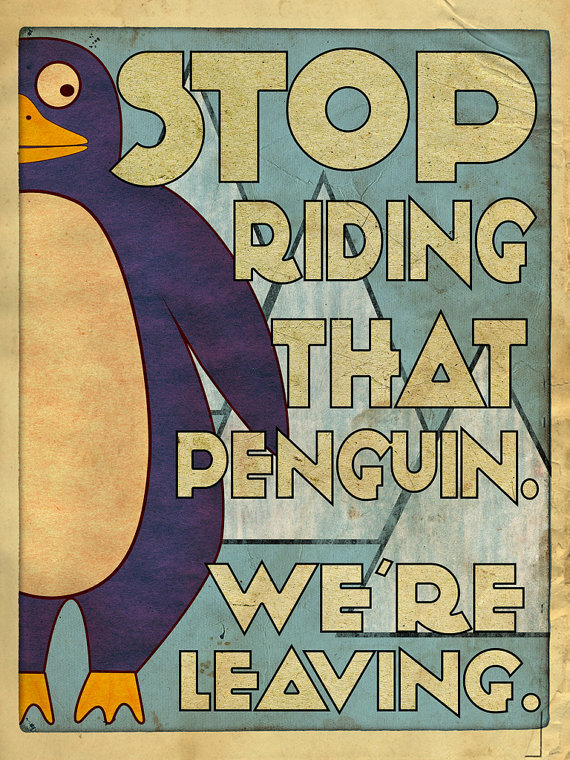 Buy them on Etsy here. Judging by the extra amounts of not so blingy bling I’ve been featuring here, I must be going through a jewelry phase lately. 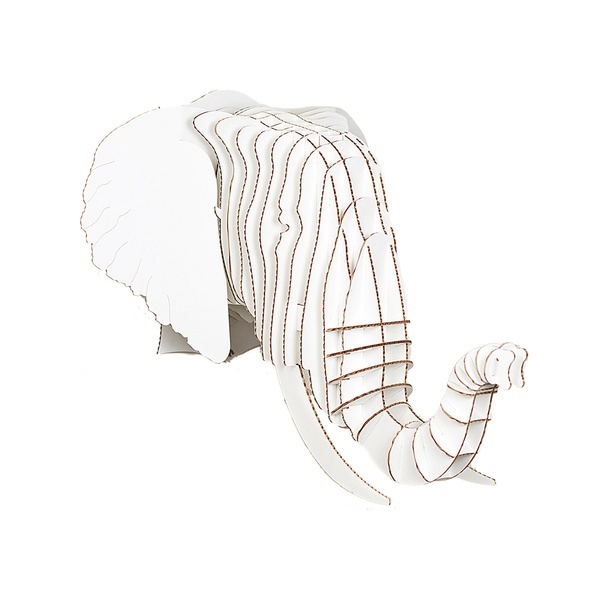 Today I’m focusing on the Etsy shop elephantine. I’ve actually been a fan of Rachel’s work (which she describes as “simple jewelry that can be worn every day”) for a while now. Probably because I do wear the same jewelry every day. And It’s very simple. Rachel did an interview with Etsy about quitting her day job to make her jewelry full time. It’s so inspiring (not that I’m quitting my fab day job anytime) for people who feel stuck in a rut. I know lots of people who feel uninspired, bored, unchallenged, you name it, at work. Maybe it’s just that time for my generation… the time for us to be finding ourselves professionally, when we feel like we should already be there. Rachel is an amazing inspiration that you really can do what you love – with a whole lot of drive and passion. I’m a big supporter of small businesses. I love Etsy for that. Supporting the little guy has almost always been more pleasant for me. If something doesn’t fit right, breaks, or just isn’t what you wanted, it’s a whole lot easier to get ahold of someone like Rachel than Mr. Tiffany. Plus, don’t you love the idea that you’re supporting someone who really takes pride in every single piece they hand make? I do. I’m definitely going to be purchasing one of Rachel’s designs today… I just have to decide which one will be first. What do you think, the nova tiny gold studs, the alain in quartz necklace, or the dash modern fine silver band? Is this too ridiculous for a baby’s room, or just the perfect amount? Because let me tell you. I want it. Left photo via. Right photo taken at H&M. I need a good source for leather. Rich, manly-smelling, soft, thick leather. 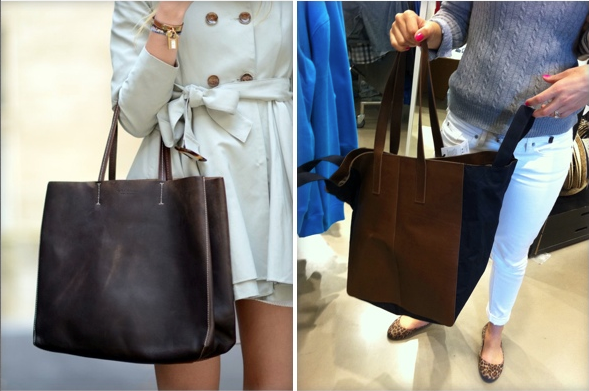 So I can make one of these wonderful, wonderful bags. 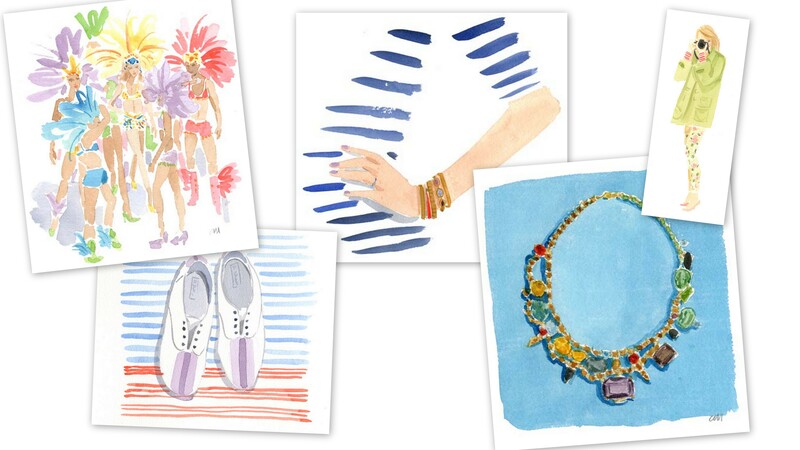 New favorite product: Custom paintings by Caitlin McGauley. I won’t be mad at the person who commissions lovely Ms. Caitlin to do one of her fabulous watercolor paintings for my birthday. Or Christmas. Or Anniversary. Or Memorial Day. She even does wedding prints. How awesome would that be to have one of these original, amazing, paintings of yours truly in my wedding dress for my wall? Seriously, I would not be mad at all.